adventurer and writer (1725-1798). 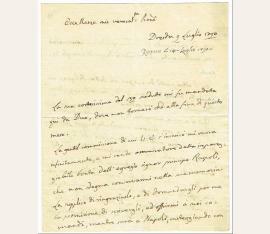 Autograph letter signed ("Casanova"). Dresden. 4to. 3 pp. To Count Antonio Collalto (“Eccellenza mio Venerat[issimo] P[adrone]". Casanova reports reports on conflicts in Europe, prompted by early revolutionary fervour, including the quelling, by the Elector of Bavaria, Frederick Augustus III, of an uprising in Dresden, and the ill-health of the Archduke Francis of Austria, and considers the threat of war from Prussia, which might be tempted to intervene in Austria's conflict with Turkey, but which he hopes will be prevented by the indolence of the court and the unwillingness of the King [Friedrich Wilhelm II], also reporting a letter from his patron Pietro Zaguri, who tells him that all Constantinople desires peace, "...Qui v'è una insorgenza di paesani, che inquieta il governo, e jeri furono mandate truppe per deprimere il loro ardire. Si spera però che la permissione generale, che il prudentissimo Seren[issi]mo elettore diede di cacciare calmerà tutto. Si dice qui che S.A.R. l'arciduca Francesco abbia sofferto uno spunto di sangue. I ministri che circondano in Slesia il re di Prussia stanno là oziosi, e nulla il Rè decide. Egli non ha voglia di far guerra, e se non ne ha voglia non la farà. Ei vuole però che la guerra sia temuta." - Casanova thanks Collalto for his letter and message from "l'egregio signor principe [Francesco] Ruspoli", asks his permission to contact the prince, and offers his services whilst he is in Naples, assuring him that he has sent by mail-coach the two little books that he had requested, possibly the Corollaire [and Seconde Corollaire] à la duplication de l'Hexaèdre donné à Dux en Bohème, both of which Casanova had published that year in Dresden. - Rare. 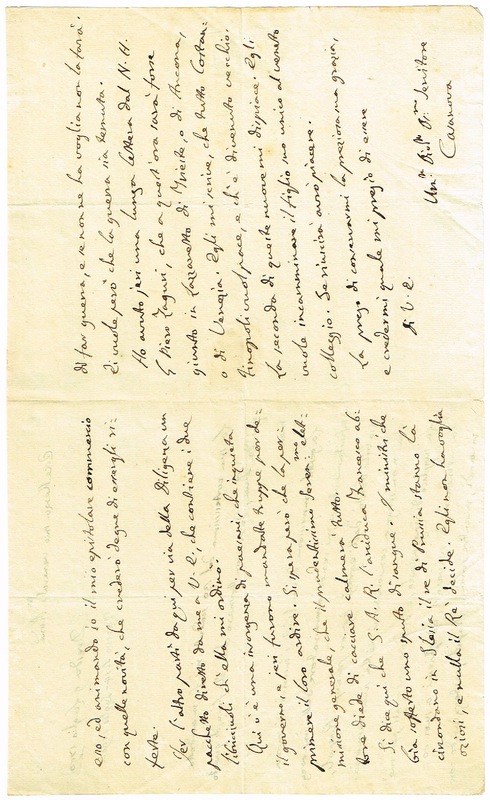 Autograph letters by Casanova, particularly of this length and interest, are rarely offered for sale at auction. 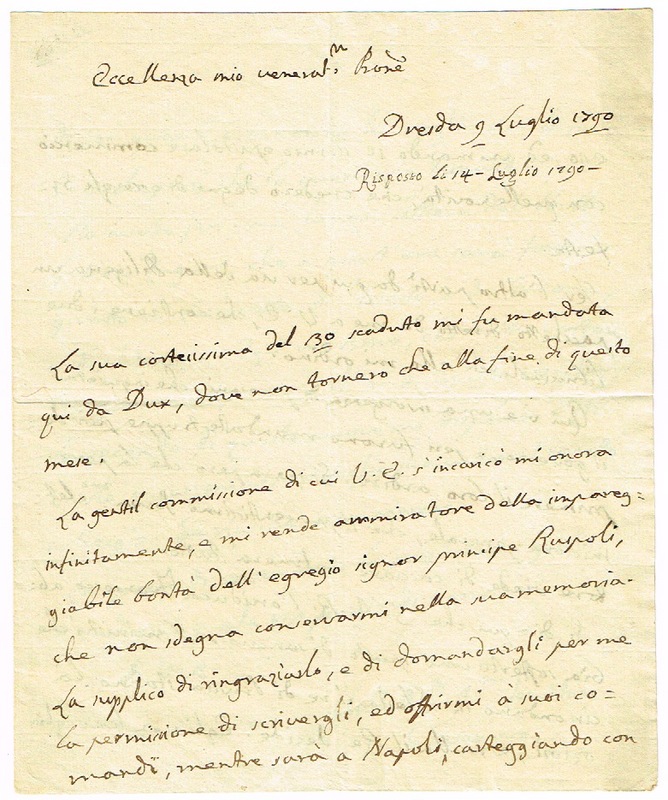 This letter shows Casanova's continual interest in diplomacy and in his patrons and contacts among the nobility. - R. Sandron, Carteggi casanoviani: lettere di Giacomo Casanova e di altri a lui (1916), p.43 (no.16)..